Greek manuscripts of Georgios Th. Modis from the period 1926-1948 never published before. Giorgos Th. Modis—not to be confused with his first cousin, Macedonian fighter and historian Giorgos Ch. Modis—was a man of letters and practiced law in Florina and later in Thessaloniki during the early decades of the 20th century. He was the son of national martyr Theodoros Modis who was assassinated by the Bulgarians in Monastiri in 1904. These manuscripts were among others recently unearthed and they comprise text related to Macedonian issues (there are other writings of fictional prose that may be edit at a later time). Even though the writing style is at times super-patriotic and the language of the early documents Katharevousa, the writings constitute authentic specimens of local expression and contain elements that are not known. 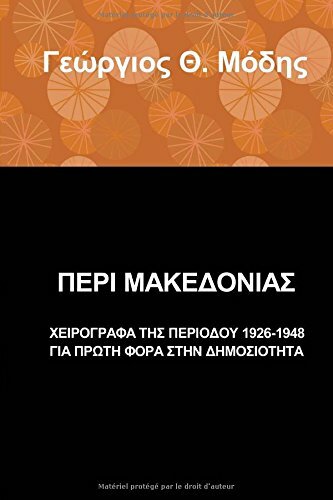 This book could be of interest to Macedonians at large, in the US, Canada, and Australia. You can dowload the book for free here. If you want a hard copy, it costs US$7 (free surface shipping in the US). Please make a check to Theodore Modis and send it to: Theodore Modis, Via Selva 8, 6900 Massagno, Lugano, Switzerland. You can also pay via PAYPAL (tmodis[at]yahoo.com) see below.